Disney; either you love his legacy, or you hate it. Tom Trapnell (LATimes) let me rip with this one. I was afraid the tongue, which was not in the sketch, would be way over the top. But we are lucky when such trust is bestowed upon us. My palette is changing, no doubt the result of adding Dr. Martin dyes to my watercolor arsenal. Next it'll be neon colors. M-u-s-t p-r-a-c-t-i-c-e r-e-s-t-r-a-i-n-t.
Wow! Fabulous! And I love the devil/angel mickeys! I used to work with Dr Martin dyes...boy, do they FADE with time! Beautiful translucent colors, while they last, though. One of your best Dave. I wish Tom had let me loose on this guy....I hate him...and yet my whole family (two nieces and their husbands and former husband ) work for Disneyworld. But I probably wouldn't have gotten the venom you got here on the left. One of my neices is the second in command at Disneyworld so don't let her know how I feel. Ooh! The close up wasn't up there when I first commented...great bumpy tongue with spit dripping off it! You certainly can do an evil looking Walt, David! And some truly scary Mickeys, to boot! 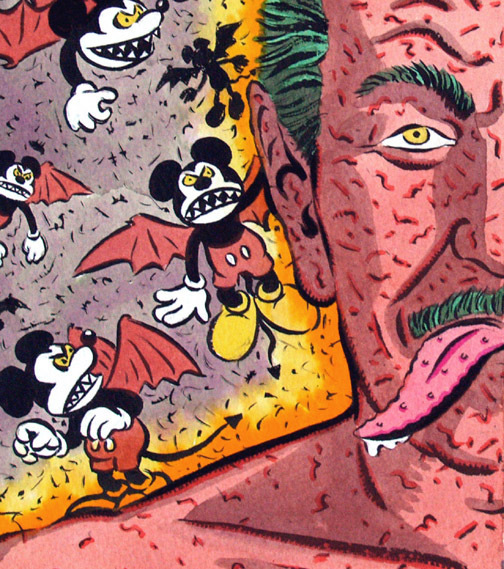 ooh, i love the devil mickeys!! i must say i am on the dislike side of the fence- i don't agree with some of their politics (although their old animation is nice)... i did a site once for a designer that was IN LOVE with ANYTHING disney. we got into a nasty argument at one point talking about all the stuff he had done to his artists, but she was so in love with the empire he had created... bleh. don't even like talking about the guy anymore. My God, Dave! what kind of skin cream did Uncle Walt use? love the mice - both teams. Dave, nice to see you do a portrait, looks great. Pretty wild! Wow, David! This one hit a nerve. I have the same parallel feelings about Disney. But who thinks about him as a person? The enterprise took over and crushed his own image. I think he was a genius. Great piece. 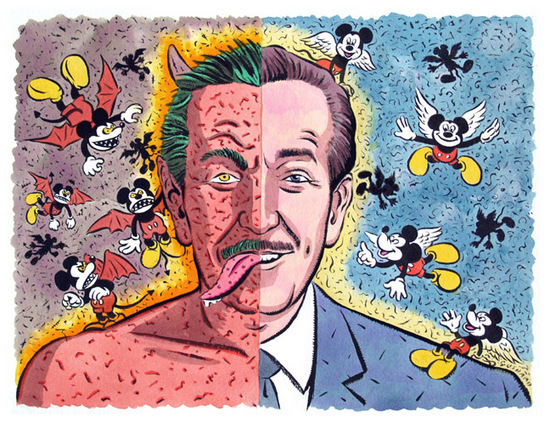 Did you know that Disney bought the land in Florida for Disneyworld under a false name because he was afraid the sellers would have taken him to the cleaners had they known he was Disney? Disney World actually uses this bit in it's schpeal about the park. He got the swamp for a song. Yes, took my kids there out of guilt and boy is it stranger and more unsettling than you can imagine. My kids didn't even like it, I must be raising them well. Oh Dave, nice piece. Man what a field day you must have had. I would have loved that assignment. I've worked in licensing and have heard so many stories about Disney culture, mostly bad but some good. Love the detail image. I for one have always admired this guy. Even spent some fun time battling my art teachers in college when I told them I was interested in working in Disney Animation! Oh the verbal crap they would throw at me! Hilarious. Almost as bad when I told them I wanted to be an illustrator! Excellent portrait! Love him or hate him (I'm bi) the Disney canon is our Sistine Chapel. Like it or not. It's the simple dynamic formula we'll have to deal with: some powerfull, well-funded ego has a plan and they need artist's to bring it to birth. In the process we (that's us in all our hoary diversity) add (or leave) something of ourselves. Who is using whom? Truth is, the name Michelangelo comes to mind before Pope What's-His-Name. A parting pot-shot, piece of wisdom you have to go to the mat for and insist on somehow: sign your work, keep your copyrights, yell loud and proud!